The significance of Arthur Streeton’s Cairo paintings is out of all proportion to the small number of works. On the strength of a two-month stop-over in Egypt on the way to Europe in 1897 he made Cairo the subject of his first paintings in London. Lifted high by a wave of artistic ambition he hoped that the sight of them might in a twinkling convince the English art world that a talented and original artist had arrived on their shores. Minarets, Cairo, 1897, the tallest and most exalted of the Cairo pictures, gives an insight into the stylistic adventure that was involved. The artist hinted in written accounts of Cairo that he found sketching there well-nigh impossible.1 Wherever he went – certainly in places he wanted to paint – people crowded around, children dogged his footsteps, men, women and children persistently jogged his elbow, begging his attention: in no place could he work unhindered. Some of his pencil drawings of Cairo look as if they may have been memory drawings, ditto some of the watercolours; and all the oils were produced in London. He took away a collection of commercially produced photographs and some of his own photographs, but very few sketches. The question that arose for him was how was he to use the material? The solution he found catapulted him into a way of painting with which he had previously only toyed. Few of the Cairo paintings trace an actual scene.4Minarets, Cairo wilfully disregards the conventions of a tourist memento, indeed, its confusion of the facts was bound to irritate any Orientalist who put a premium on accuracy. Whereas some details are broadly characteristic of Cairene architecture, others identify a well-known tourist site. Thus the relief within the arch to the left of the gateway is specific to one of the three main gateways in the walls of the old city: the Bab Zuweila. The minaret on the right of the picture could be one of the pair that rise above that gateway yet its partner is conspicuously absent from the image. The triple-storeyed tenement above the gateway did not belong to Bab Zuweila at the time of Streeton’s visit: some of his drawings showed the gateway as it then was, yet he chose to ignore what he knew to be fact. Likewise, the forms and detailing of the picture’s three other minarets and the domes are not from the vicinity of Bab Zuweila. The ridged pattern on one of the domes (‘borrowed’ from the madresa-mausoleum Amir Iljay al-Yusufi in another part of the city) was perhaps introduced by Streeton because its swirling lines assisted the upward movement he sought to convey in the painting. Of the memories Streeton cherished to the end of his life, his sense impressions of Heidelberg and the camp at Sirius Cove had been central to his visualisation of those places. Cairo, too, held for him the luxury of an immersive experience. Minarets, Cairo is a potpourri of sense-impressions. The brushwork, gathering impressions, has the performative rhythm of an act of recall. By touch it animated, alike, the heavy ashlar foundations of Cairo and the flickering motion of birds in a blue blaze of sky. Stroke by stroke Cairo’s vertiginous street architecture was rebuilt in terms of colour, light and texture. From a ground teeming with people the scene lifts and circles into light via the round arch of a vast oriental gateway and successive upward steps of flimsy tenement houses, the curves of white domes, arrowing lines of tall minarets and impossibly tall palm trees. The life of the picture is in the cumulative brushstrokes, each distinct, square, and as palpable to the eyes as an actual touch: the memory here may be the constant touching of his person by Egyptians which had so jangled his nerves and oppressed his mind in Cairo! Without relinquishing illustration, the painting steered towards expressive abstraction. Movement and the overall direction of the people in the street is suggested partly through a simple repeated element of blue-clad figures and partly by a scrawled line of white paint in the direction of the gateway. Cloth awnings strung over the street have been tailored to resemble the lateral mark of a slashing stroke of the brush. Dots and dashes of colour describe palm branches, fruit, and birds. Frank McDonald, showed the painting to James Fairfax in early February 1990 and wrote down his response: ‘as you know I don’t buy much Australian art [nowadays], but [this is] something remarkable. It’s a lovely thing. I’m very taken’.9Minarets Cairo’s first owner had been Rose Carson, wife of William Carson, a Sydney wool-broker. The daughter of a wealthy stockbroker, she was living with her parents in London during Streeton’s first years there. At a guess, she bought the painting through Walter Barnett soon after it was painted. Within a few years Streeton had a direct connection with her parents, Lewis and Esther Aarons, in whose country house, The Hayes, Hayes Lane, Kenley, Surrey, he spent a week in mid-summer 1904. Rose was visiting her husband in Sydney at the time. 1. 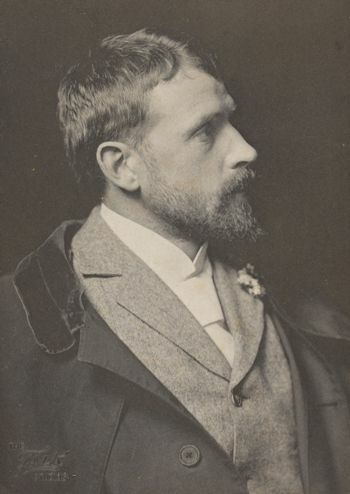 The accounts nearest in date are letters written from London 1897 and 1898; he wrote a coloured impression for the red page of The Bulletin, Sydney, 21 October 1899; the last, and possibly the truest to his experience, are threaded through the notes he made towards a personal narrative in the early 1940s (Oliver Streeton estate). 2. Streeton mentioned that he owed Barnett for the camera in an undated [summer 1897] letter from his first studio in London (WH Barnett papers, in WH Gill papers ML MSS 285/14). 4. I am indebted to Emma Kindred who lent me her doctoral thesis ‘Passages through the Orient: Arthur Streeton in Cairo’ (2012). 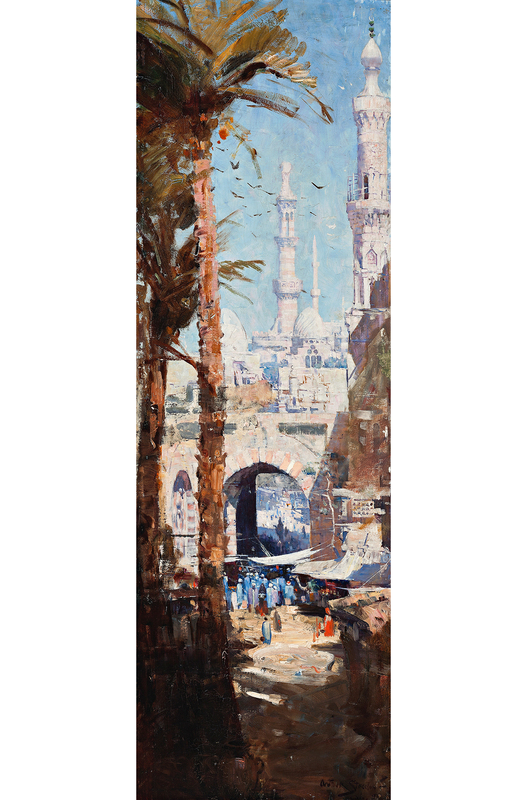 In addressing the subject of what Streeton did, and did not, represent of Cairo, Dr Kindred has opened a key subject for this artist, which is where he, at any moment, positioned his art in relation to straightforward factuality. Minarets, Cairo was not yet available for her to discuss. 5. Quoted by Emma Kindred, op. cit. p. 1. Streeton wrote similarly in another draft, which I quote from my hastily written notes of the 1980s: ‘The human brain is remarkable in its conscious and unconscious activity. It may resemble a man seated with many books or closed drawers within arms’ reach, [when one puts out a hand to one of these,] thought opens up instantly, … each .. may be closed at will and fresh ones reviewed, and each enclosed memory frequently leads on to another’. It says something for the strong impression Cairo made on the adult Streeton that, recognising as he did that a child was a far more powerful receptor of impressions than an adult, he should describe himself, at his ‘first sight of Cairo’ looking ‘with the wondering eyes of a child’. 6. Letter to Tom Roberts, 28 June 1898. Spong sailed from Sydney on SS Massilia on 27 February 1898 (Sydney Mail, Sydney, 6 March 1897, 489). Spong’s success was mentioned British Australasian, London, 28 April 1898, 897 – the scenes were ‘Off the Waght el-birket’ and ‘The Mosque El Mu’yierd’ (i.e., the mosque at Bab Zuweila). An idea of those paintings may be had from two watercolours of Cairo street scenes in Christie’s Travel and Natural History sale, South Kensington, London, 3 October 2006, Lots 110, 111. 8. As it happens, Streeton was to succeed even in the matter of bread and butter. His wife, a violinist who had managed her own string quartet, simply required him to apply himself in the same business-like way she had. 9. McDonald papers, Art Gallery of New South Wales archive, researched for me by Hannah Steinbauer.